The Australian footwear industry has endured a challenging retail environment the past decade thanks to the influx of low-cost foreign importers and very competitive online e-tailers. It’s shaken the status-quo considerably and forced the industry’s structure to change significantly. But according to recent IBISWorld’s Footwear Retailing market research, while the footwear industry has lost its footing in the past five years, it will return to modest revenue growth despite online competition. The report states the industry is highly dependent on economic conditions and consumer confidence, both of which have been adversely affected by the financial crisis that commenced in 2008. The industry has been plagued by the same problems facing most retailers in Australia – weak consumer sentiment and increased competition. Since capital intensity in the industry is low – as the industry is service-centric and revenue is more strongly correlated to the level of labour – retailers in the industry need to provide high levels of customer service in order to assist customers with trying on shoes and finding the right size. Low margin retailers, such as Payless Shoes, do not invest considerable resources in providing specialised footwear training for staff. Other retailers, however, are increasingly willing to spend on employee training in order to differentiate their brands through customer service and overall store experience. 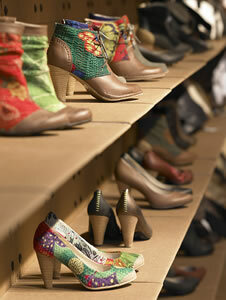 Gloablly, the footwear market is expected to reach $195 billion by 2015, according to research from Global Industry Analysts. Market growth is also predicted to rebound as consumer confidence builds in the post-recession economy. So the key message from all of this reserach? Find your point of difference and maximise it. Use it to leverage your marketing and promote your uniqueness. Fuse your bricks-and-mortar with online so your customer has the power to decide how they’d like to purchase. If you’re a footwear retailer, we’d love to know what you’ve done in-store and online to innovate and differentiate you brand. Have you considered introducing an in-house footwear line?